Hybrid courses often result in a decrease of “face time” since in‐class activities are replaced by time spent outside a traditional classroom setting. For example, “flipping” a class so that students experience the primary lecture components of a course as their homework and then using class time for more active‐learning activities is a form of hybrid pedagogy. Social presence is especially important in online courses as it helps to reduce student feelings of isolation. Creating a human connection comes fairly easily in a face-to-face class, but online instructors have to work at it. If you’re not careful, you can find email taking over your life. Create an engaging introduction video that makes students want to learn more. This introduction is one of the first things students will see when they begin your course. 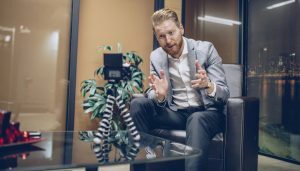 Introductory videos have the potential to humanize your presence, excite students about what they’ll experience in your course, and dispel fears among students who are new to online learning. Use course announcements, use email to send individual group or class-wide messages, participate in the discussion boards, and use synchronous communication to enhance your social presence.